Sometimes several Events are chosen by a team defending one Endstate that are ignored in other scenarios. We call these Unique Events. For example, in a US and Global Climate Change workshop, a Unique Event might be that Cold Fusion Water Heaters are Commercially Available in 2013. In a U.S. Healthcare workshop, a Unique event might be that Total Healthcare Expenditures as a percentage of GDP are constant starting in 2010. 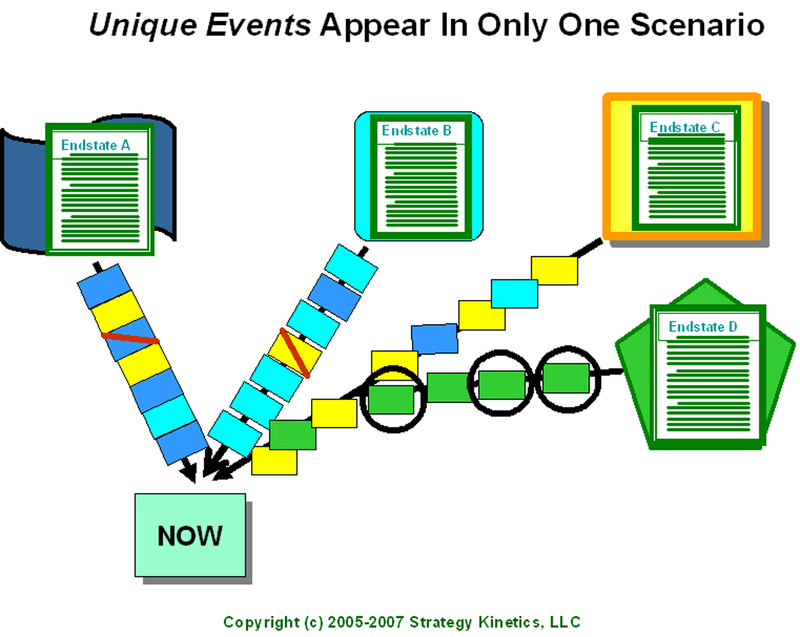 Since only one future depends on their occurrence, adopting a strategy based substantially on Unique events may entail higher overall risk since fewer actors care about these events. This is not to say that adopting such a strategy is necessarily a bad idea. In many business situations, for example, higher risk may bring with it higher rewards. However, task forces, working groups, committees and others focused on resolving a given Wicked Problem may find that alternative strategies for resolving a given Social Mess are more attainable because they are based on a greater preponderance of Common Events rather than Unique Events.